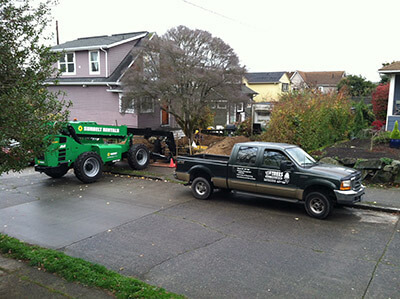 SNOHOMISH, WA: Big Trees Inc., (https://bigtreesupply.com/), a tree sales and transplant company in the Seattle area, recently helped a man who wanted to save a large Dogwood tree on his property. The tree was in the way of remodeling and expanding the client’s garage and parking area — both premium features in the neighborhoods of Seattle. The client contacted Big Trees about moving the huge tree. He told them the base trunk had a diameter of over a foot and a half wide, and that the canopy of the tree was 20-feet plus in height. With his daughter having childhood memories with the tree, he felt strongly about saving it. The tree was positioned very close to some overhead power service lines going to the neighbor’s home. Once the large root ball was dug, it was too heavy for any ground based tractor to lift conventionally. Fortunately, this tree only needed to move a short distance. The crew dug a trench in the direction that the tree needed to travel, and with an extendable boom forklift, the root ball was scooped and slid to the front of the new trench, like a big cookie on a bakers sheet. When all the markers and measurements were checked, it was decided that it was time to re-bury the Dogwood in its new planting location. “There are a lot of ways to handle these larger trees, and in spite of most situations where it can look really difficult, our crews and techniques have enough experience to see a lot of great things accomplished!” says Todd Holmes, Big Trees’ Operation Manager. Nancy Penrose is the owner of Big Trees Inc., located in Snohomish, WA in the Seattle area. The company is one of the largest tree nurseries in the Seattle area with over 120,000 trees available in over 300 varieties. They not only deliver young trees, but also mature trees in a wide range of sizes. Some types of trees available include spring flowering, deciduous, evergreen, and privacy trees. The company also does tree transplanting including large trees. Their blog can be seen at https://bigtreesupply.com/blog/ or http://arboristblog.com/ They can be reached at 360-563-2700.